The Day started of like any other at the MCG (Marlboro Cricket Ground) the Heavy roller was pulled out and then started up to roll the pitch. 3/4 way to the pitch the roller switched of and this was a sign of things to come. The roller kept “choking” and would not stay on so the big muscle had to be called in and some manual labour was required to roll the pitch to get it half decent to play on. 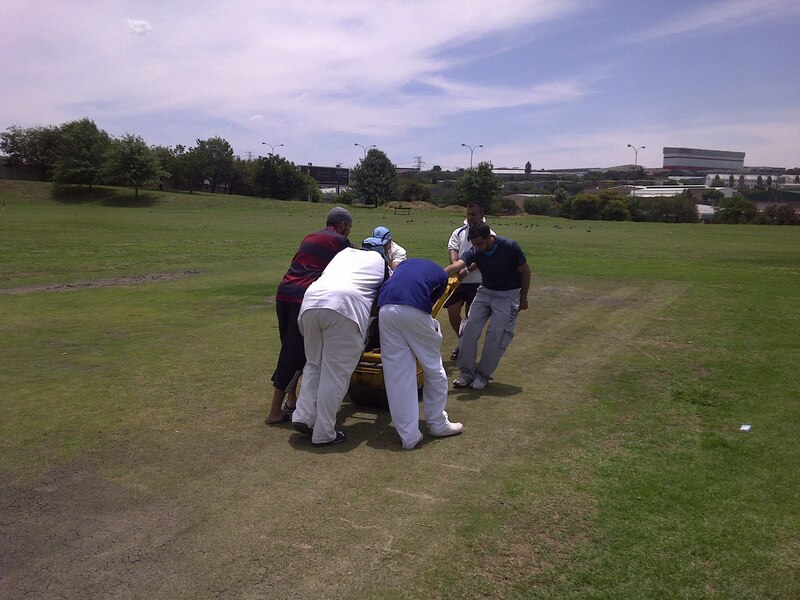 The team of muscle didnt to too bad a job in rolling the pitch and SA5 guest player Eboo “Chacha” must have dreaded deciding to assist us as he was made put to pushing the roller. The SA7 team went in to bat and Hazrat Joe Chotia Opened the batting with Eboo. Hazrat Joe couldnt come to terms with the early unpredictability of the pitch and was dimissed early on. Muhajir “Broekies” Rawat then partnered with Eboo to up the run rate and keep the score ticking along. Wickets fell regularly and Hamza Bhai “Boom Boom” then stepped up and hit a super 54 with Abed rotating the strike to ensure a decent total of 180 for 7 was reached in the allotted 40 overs. 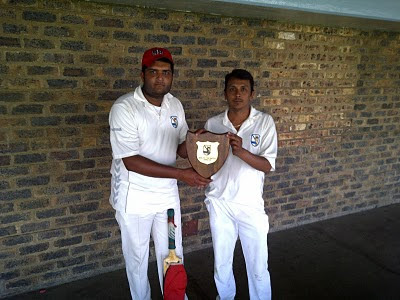 The opening bowling partnership of Muhajir “Broekies” Rawat and Mayur “Manickchand Patel tore through the opposition line up and after 17 overs Alberton were 65 for 9. Muhajir and Mayur bowled 8 overs on the trot in an attempt to bowl Alberton out. This didnt work out and the last wicket partnership for Alberton was +/- 70 runs before Nasief got the last wicket caught at midwicket by Avi “Careless”. SA7 continue on the winning path, winning the game by 38 runs. congrats on your 5 wicket haul Mayoor...keep it up mate!